Holiday Hootenanny Update! FloydFest 14 VIP package in Auction! We are gearing up for quite a ride folks – the musicians are mingling, the anticipation is ascending, the mojo is major! The Holiday Hootenanny is going to be an amazing night of jams full of funk, jazz, Blues & Americana, a show you don’t want to miss! And best of all, we get to team up with the amazing folks from Atlanta Habitat for Humanity to bring an event that IS Atlanta. PLEASE make plans to come on out and support a wonderful cause all the while seeing some jams and spontaneous collaborations unique to the moment! TDawg Presents is excited to have on the silent auction tablet a top tier VIP package to FloydFest 14, July 22-26, 2015, on the beautiful Blue Ridge Parkway located at mile marker 170.5 in Floyd County, Virginia! This package includes a pair of VIP (High Roller All-Access) tickets, which will actually be a package that includes 2 HRAA VIP tickets, 1 HRAA tent tag, and 1 HRAA onsite parking pass. In addition, you and a fellow festivarian get fully catered meals, complimentary beer and wine all day, and backstage camping. You get it all—from Wednesday’s SoundCheck Party to Sunday’s AfterParty to Monday’s post-party depression (PPD). All of this and more is a $1,500 value, but worth so much more for the worldly well-being of one’s self! My wife and I have been to several FloydFests over the years, and the journey to get there compounded with the journey that is YOUR festival experience makes this one a destination event you don’t want to miss out on. The phenomenal Lineup thus far is as follows: EMMYLOU HARRIS, DRIVE-BY TRUCKERS, LEFTOVER SALMON, LORD HURON, KELLER WILLIAMS’ GRATEFUL GRASS WITH JEFF AUSTIN & OTHERS, THE CHRIS ROBINSON BROTHERHOOD, SHOVELS & ROPE, GREENSKY BLUEGRASS, KELLER WILLIAMS, SAM BUSH BAND, TRIGGER HIPPY, THE DEVIL MAKES THREE, PETER ROWAN’S TWANG ‘AN GROOVE, NICKI BLUHM & THE GRAMBLERS, JEFF AUSTIN BAND, THE LARRY KEEL EXPERIENCE, KELLER AND THE KEELS, SISTER SPARROW & THE DIRTY BIRDS, SWAMP CANDY, ANNABELLE’S CURSE AMERICAN AQUARIUM, FOLK SOUL REVIVAL,	AND MANY MORE TBA!!! Bassist Kenny Palmer will join in the highly anticipated Blueground Undergrass Reunion performance! Kenny was one of an esteemed few who handled that role flawlessly and effortlessly. He will be joined by Rev. Jeff Mosier, Johnny Mosier, Mark Van Allen, David Blackmon, and Vic Stafford. 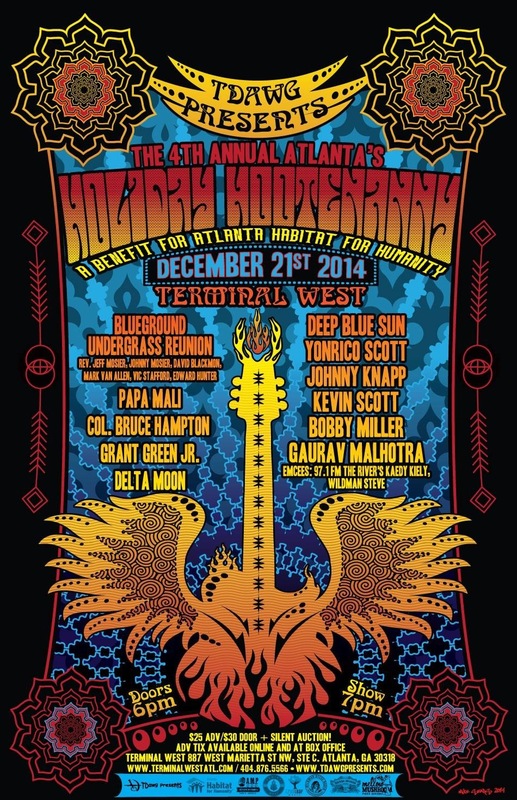 ← Atlanta’s Holiday Hootenanny Schedule Released!